Customer Parking Only signs can help deter the wrong people from using your valuable parking spaces. This sign tries to ensure that the only people parking at your store are the people giving you business. Our Parking Signs are made out of reflective aluminum and will reflect at night when light hits them. Our Customer Parking Only Signs are a great way to make your parking lot look professional so order yours today. Stop crime before it even starts by using these Security Decals in your windows. When burgulars see these decals they'll know that your home is under protection. These vinyl or polyester decals are screen printed for outdoor durability. If you are the owner of a hotel/motel, a very handy sign to have in your window is our Check In Flashing Neon Sign. This sign can eliminate the confusion that a new guest faces when they pull into your establishment. Simply place this sign in the window of your office so that it may direct new guests to the proper sign-in area. This neon sign features a power cord that fits into a standard outlet. Chain and hanging hardware are included with each sign. These signs are intended for indoor use only. 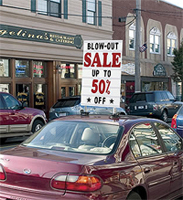 If you want a neon sign for your storefront, but have limited funds, then look no further than our Economy Neon Signs. These signs still have that neon sign charm while selling for a franction of the cost of a normal neon sign. These signs keep it simple and to the point. All of our Neon Signs are 100% made by hand and use only U.L. listed transformers. They even come with the hardware you need to hang it in your store's window. You really can't go wrong with this kind of neon sign. The low price and long-lasting value make this Economy Neon Sign a great business investment. Have you ever wanted a cup that was made just for you? Well you're in luck, because at SS Nautical, we offer such a product. Our Stainless Steel Travel Cups are great for anyone who wants a customized cup. Not only that, but these cups can make a great gift to a loved one. This sleek 14oz. steel (both inside & outside) cup is made to last, featuring a resilient plastic lid, handle, and base. It should be noted that these cups ARE NOT dishwasher safe. Use these Antenna Pennants on the front line of your auto dealership to attract attention to your car lot. These pennants are a great way to promote sales, special deals, and more! These pennants are made out of quality plasticloth and come in a variety of color combinations. Promote your dealership with colorful antenna pennants. Buy enough for every car on your lot and watch them sell in no time. This Exit Braille Sign makes it easy for your building to comply with ADA Laws. Not only that, but it is only proper to have exit signs for people with disabilities. Braille signs are made of high impact styrene that can be used indoors or outdoors. All pictograms, borders, lettering and Braille are raised 1/32 of an inch. ADA signs have radius corners and double faced tape on the back. Our braille signs are available in; white lettering and graphics on a blue field, white lettering and graphics on a black field, black letters and graphics on a taupe field. Keep your building up to date by using our Exit Braille Signs. We can produce quality 10oz. vinyl banners to meet your needs. These banners are made to be used both indoors and outdoors. In order to create a longer-lasting banner, we hem all of the edges of the banner. Most of our competitors only hem the top and the bottom, creating an inferior banner. We don't cut corners here. At SignOutfitters.com, we believe that quality comes first and we refuse to ship out a product that we are not satisfied with. Our professional designers will layout your your banner the best way possible and will send you a proof of what your design looks like. All proofs will be emailed to the address provided at Check-Out. Just in time for Fall, this Halloween Witch Weathervane will both delight and scare you! This weathervane is made from quality, rust-free aluminum and will not rust in harsh weather. This weathervane features a witch to decorate your home's exterior. 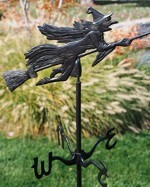 This weathervane can add a certain flair and what better time to put a witch on your house than on Halloween. Don't be a Halloween grinch and buy one of these weathervanes today! Want to make sure your sign sticks out in a crowd? Get our Deluxe Vertical Car Top Sign from www.SignOutfitters.com and this won't be a problem anymore. Your advertisement will follow you wherever you go, and is quick to set up. Just place this sign on top of your car and watch it work wonders. Since it's on the top of your car, the sign will be high enough for just about everyone to see it with ease. Best of all these signs get around many of the restrictive sign codes that ban sidewalk signs. Not only that but it won't get knocked over easily. This sign is a great way to advertise without spending a fortune. If you're looking for an economical advertising solution, this is the product for you.